With many of the traits and characteristics of the original, Northern Lights Auto seeds are a perfect choice for growing stout, compact plants that are easy to grow and offer a high quality yield. 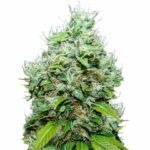 Northern Lights Auto seeds are very easy to grow, perfect for beginners and the more experienced growers alike. 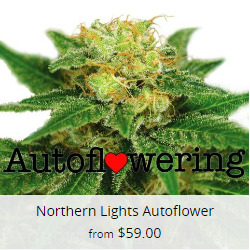 Given favourable conditions, Auto Northern Lights will grow well both indoors and outside. This short autoflowering marijuana plant produces close lateral branching, leading to a squat, bush-like shape. The plant automatically begins to flower after approximately ten days from sprouting, and this continues for a further 56 days until complete maturity is achieved. 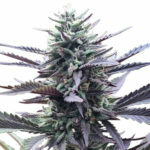 With a mature height of between 60-80 cm, Northern Lights Auto seeds are not the tallest plants, but they are great for discreetly growing in gardens or on balconies, as well as being a great strain for indoor Sea-Of-Green growing techniques. Despite it’s fast flowering time and lack of vegetative growth, Northern Lights Auto seeds produce reasonable harvests of approximately 120 grams of high quality, dried buds per square meter. 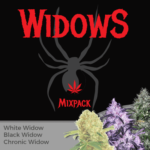 With it’s dominant Indica heritage, expect Northern Lights Auto seeds to produce a relaxing body stone feeling, while the Sativa element creeps up slowly, leaving you feeling euphoric, happy and stress free. Although Northern Lights Auto seeds don’t produce the tallest plants in the marijuana garden, the plant displays all the characteristics of the feminized Northern Lights seeds, with broad, dark green leaves and an abundance of resin coated buds. With their limited high, close, lateral branching and bud structure, Northern Lights Auto seeds are ideal for Sea-Of-Green growing. Grown either indoors or outside, plant the sprouted seeds in their final pots, allowing only a small space between each pot. Their stable genetics produce a uniform canopy that should be dense and almost dark at the base of the stem. Unlike conventional feminised seeds, Auto seeds flower and grow simultaneously, reducing the time the seed takes from germination to harvest. Northern Lights Auto seeds grow best when given long hours of good quality light. 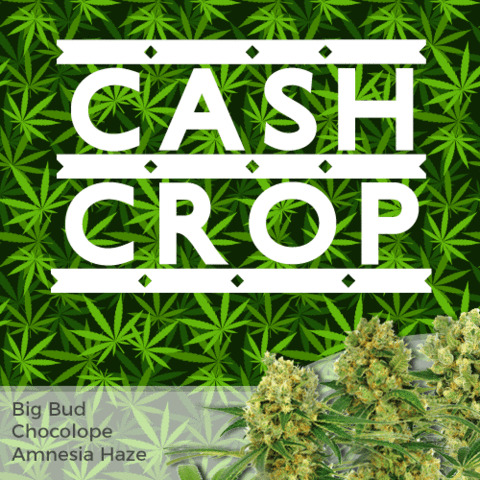 Outdoor growers can produce multiple harvests during a good Spring and Summer, while indoor growers should give their plants a minimum of 18 hours of good quality light, with many growers suggesting 20 hours to get the very best growth and bud development. The flowering buds are identical to standard Northern Lights plants, colorful and coated with trichomes, and just like regular marijuana plants, these trichomes will turn from clear to a cloudy, milky color as maturity approaches. Once harvested and manicured, dried and cured the smell, taste and effect from the buds are identical. The main differences are Northern Lights Auto seeds are faster, easier to grow and require no set photo-period to flower and mature. 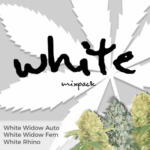 Northern Lights Auto seeds are available to buy in packs of 3, 5 and 10 feminized seeds. 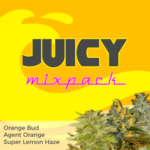 All of the marijuana seeds purchased through I Love Growing Marijuana are guaranteed to arrive using the very best stealth shipping methods, with postage and packaging absolutely free. With guaranteed free delivery, guaranteed germination and all the help, advice and customer service support you could need, why go anywhere else ? ?